L to R: Mr William McDonald (former slater), Dr Sempill (later to be Sir Ewan Forbes), Isabella Sempill-Forbes (nee Mitchell, later to be Lady Isabella Forbes), Mrs MacEwan (wife of Rev. 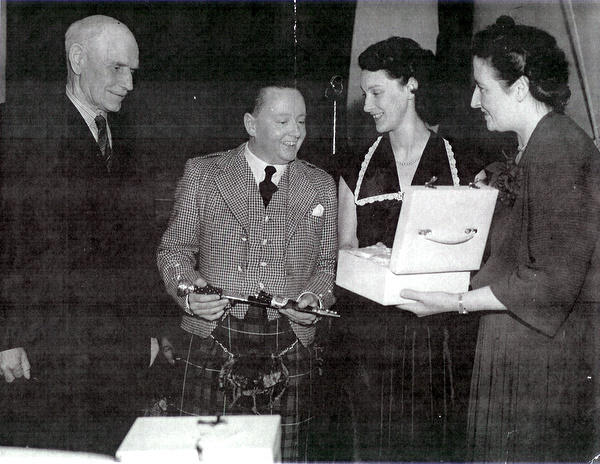 Peter MacEwan who had officiated at the wedding in October 1952). Dr Sempill-Forbes had decided to leave general practice and this event had been arranged by his patients in Alford as a mark of their gratitude. Dr Sempill/Sir Ewan had led an interesting life, some of the details of which are described in his book "The Aul' Days". He died in 1993 and Lady Isabella in 2002.